Will Obama's Feds Finally Aim High? Looking at California's water issues, one NOAA regional office took account of how killer whales depend on fish runs. Will a judge allow the Northwest regional office and other federal agencies continue to look the other way in regard to Columbia River fish runs and Puget Sound's struggling orcas? Will it never end? Evidently not any time soon. U.S. District Judge James Redden has proposed sending the Obama administration's -- nee the Bush administration's -- biological opinion on operation of its Columbia River system dams back to the drawing board for another three months of tinkering. The feds can choose this "voluntary remand," or they can let the judge rule on the BiOp just as the Bush administration submitted it in 2008. It's up to them. Redden wants an answer by this Friday (February 19). The second option, summary judgment, would not seem an atrractive way to go. Redden made it clear last spring that he had reservations about the BiOp. Last September, in an attempt to save the document from legal oblivion, the feds issued an "Adaptive Management Implementation Plan." The plaintiffs, including more than a dozen environmental and fishing groups and the state of Oregon (joined amicus by the Nez Perce tribe), argued that under the federal Administrative Procedure Act, the court couldn't consider a document submitted after the fact. In an exchange of briefs that ended last month, the feds asked Redden to let them withdraw the BiOp, tack on the adaptive management plan, and re-submit the two as a single package. The plaintiffs argued that if Redden remanded the BiOp, the feds shouldn't be able to just add the adaptive management plan and ignore everything else; instead, they should have to reconsider the full range of issues. The feds replied, in a brief submitted on January 29, that they had already done so; that's what the adaptive management plan was all about. The judge didn't buy that. If the feds come back with a revised document, he said, "(t)hey must also include new and pertinent scientific information relating to the proposed action (e.g., recent climate change data). If that scientific data requires additional analysis or mitigation to avoid jeopardy, Federal Defendants must adequately address those issues. I will not sign an order of voluntary remand that effectively relieves Federal Defendants of their obligation to use the best available science and consider all important aspects of the problem." So is the feds' glass half empty or half full? One one hand, they got what they wanted: they can have a remand. Redden will let them add the adaptive management implementation plan. On the other hand, they didn't: Redden has made it pretty clear that just adding the adaptive management plan won't save the BiOp. When the feds submitted the management plan to the court, they touted the fact that it had been reviewed at a meeting of independent scientists. But they refused to release any background documents about the meeting or the discussions that preceded or followed it. Finally, after a couple of months, they released some documents in which scientists expressed both positive thoughts and strong reservations. But -- raising what looked suspiciously like a big red flag -- the feds kept an even larger number of documents hidden. "We got a chunk of" the missing documentation at the end of November, says Earthjustice attorney Steve Mashuda, but hardly the whole enchilada. "Overall," Mashuda says, "the feds have provided the court and plaintiffs with only 121 documents while identifying an additional 272 . . . that are being withheld based on a claim of (attorney-client) privilege." In addition, after reviewing what the feds had turned over, the plaintiffs concluded that "there were many more documents that almost definitely exist, but which the feds had not even identified." Presumably that's part of what Redden had in mind when he wrote that "Federal Defendants recognize that they must supplement the Administrative Record with all of the documents that support the (adaptive management implementation plan)." In the redacted messages, did any of the scientists discuss the BiOp's sanguine treatment of killer whales? Other people certainly have. "Hope [for recovering wild chinook salmon runs in order to speed the recovery of southern resident killer whales, aka Puget Sound orcas] flared in early 2009, when the Obama administration's blueprint for Sacramento River salmon affirmed this salmon-orca connection and promised to put policies in place that would result in more wild salmon," Carl Safina wrote recently in the Los Angeles Times. Safina, president of the Blue Ocean Institute, author of three books about the oceans, and former National Audubon Society vice-president for marine conservation, wrote that this "seemed like a strong first step in protecting West Coast salmon stocks." "But then," he wrote, "two months ago, in a swift trick no one saw coming, the Obama administration embraced the Bush administration's failed salmon plan for an even more important watershed, the Columbia/Snake River system. . . . Federal scientists say [the] decline of Columbia/Snake salmon is the largest single change to the resident killer whale's food supplies. Yet the administration's Columbia plan seems to ignore that connection. While the Sacramento plan stated clearly that increasing wild salmon stocks is important -- for the whales and for people alike -- the Columbia plan contends that hatchery salmon will be enough to compensate for further losses." Indeed. "Resident," as opposed to transient killer whales eat fish. Southern resident killer whales eat very little except salmon. (They may nibble occasionally on a couple of dozen species, but they don't eat a whole lot of anything else.) And the salmon they want is chinook. Why are our killer whales so picky? Go to Ray's Boathouse. What kind of salmon do they have on the menu? Chinook, of course. Go to any fish store. Price the salmon. What's most expensive? The chinook. People like it. Well, orcas like it, too. This is, obviously, a problem. Puget Sound chinook are listed as threatened. A half-dozen chinook populations from the Columbia and Sacramento river systems are listed as threatened or endangered, too. It's getting harder and harder for a killer whale to find a square meal. But the whales (yes, they're not really whales) are willing to do whatever it takes. Ken Balcomb of Friday Harbor's Center for Whale Research says this looks like it will be the eighth consecutive year in which pods from Puget Sound have swum south to Monterrey Bay, looking for salmon. Maybe they've always done it. But no one ever saw them do it before. Conversely, back in the 1970s and early 80s, people did see them in the San Juans every month of the year. The California trip "couldn't have been part of the pattern in the 70s," Balcomb says. If a lack of food is a big reason why southern resident killer whales are endangered, just keeping the food supply constant won't enable them to recover. If you want more whales, you must presumably provide more food for them to eat. NOAA followed this logic in last year's biological opinion on operation of California's Central Valley Project and California State Water Project, which provide water for Central Valley agriculture. That BiOp looked at the projects' impact on salmon in the Sacramento and San Joaquin river systems, and therefore on the Southern Resident Killer Whales that eat them. The authors concluded that wild chinook populations had to grow. To restore wild fish runs in the face of climate change -- in part to develop a larger food supply for the whales -- the biological opinion called for operating changes that might make 5 to 7 percent less water available to California farms, and for a long-term effort to get fish above Shasta Dam. "I was amazed," Balcomb says. 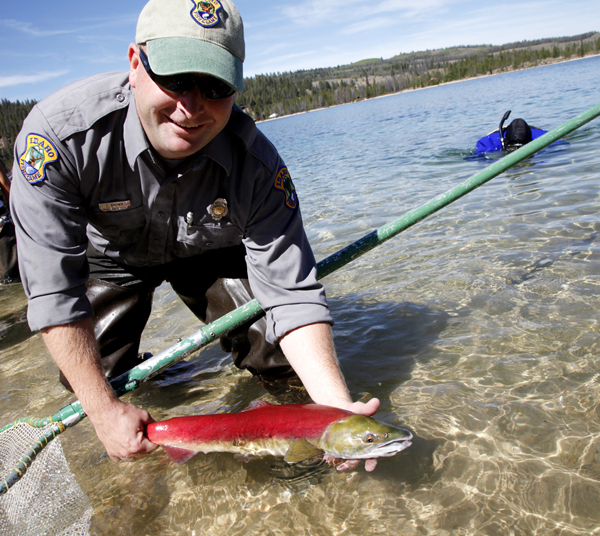 NOAA Fisheries took a conspicuously different approach in its BiOp on the Columbia River dams. It merely said that the number of chinook produced in hatcheries "more than offsets losses" at the dams, so killer whales are "not likely to be adversely affected" by operating the hydro system more-or-less as usual. The Central Valley Project BiOp concluded that one couldn't rely on hatcheries to supply killer whales with food over the long haul. The Columbia BiOp plaintiffs have pointed out that hatchery chinook probably leave something to be desired; compared to wild fish, they tend to be smaller and less fatty, and they often come back all at once, making a given food supply available for a shorter period of time. Probably more significant, the BiOp takes the current degraded status of Columbia River salmon as a baseline. Balcomb and other killer whale and conservation biologists wrote to NOAA head Jane Lubchenko, urging her to incorporate the recovery of killer whales into the BiOp. They suggested that Columbia River chinook may hold a special place in orca recovery. The main alternatives to Columbia chinook are Fraser and Sacramento river fish -- which are laced with toxic chemicals. The scientists never heard back. NOAA has never said an additional word about Columbia River salmon and killer whales. Not publicly, anyway. It's "fair to say that they have ignored it completely, to our knowledge," Earthjustice attorney Mashuda says. He suggests that along with climate change, killer whale recovery is one of the main things Redden will probably want to see addressed by the "best available science." It's hard to imagine the judge settling for less than NOAA has already done in its opinion on the California water projects. Will the feds actually start talking seriously about killer whales and climate change? Will NOAA's Northwest regional office take those factors as seriously as NOAA's Southwest regional office has already done? Will the federal government finally be willing to sit down and try to work things out with the other side? Or will the feds keep insisting that the adaptive management implementation plan is as good as it gets? "This is their one last chance to get it right," Mashuda says. If they try just resubmitting everything that Redden has already seen, they can't say they weren't warned. "Federal Defendants are free to disregard the court's suggestions and simply insert the (adaptive management implementation plan) into the 2008 BiOp," Redden wrote. However, "[i]f Federal Defendants conduct a superficial, ten-day remand (as they have proposed), I will view that final agency decision with heightened skepticism."